On Saturday 11th April the accolade of my first market of the year went to Three Thinking Collective, a group of small-business-owning ladies from Birmingham who have come together to put on their own craft events. Their debut market took place on a sunny day in The Prince of Wales' beer garden in Moseley; soon bustling with punters looking to enjoy some independent shopping & hot dogs in the sunshine, all washed down with a cheeky pint. My offerings included zines, limited edition prints, and my new line of silly boyband cards. Not an expert stall holder by any means, my arrangement was a far cry from some vendours who had stands, shelves, vintage suitcases; all manner of professional-looking props to make their products look the biz, also maximising the use of the table space by showcasing upwards and outwards. For me, this was the first time I'd even brought my own table covering and, whilst it was an old duvet cover, I took pride in that. I also managed to prop Bill Murray up steadfast & certain, meaning that, despite the bursts of wind rippling though the patio, he wasn't going anywhere. The day was a really positive experience and organisers Kate, Lydia & Harriet were upbeat, welcoming and warm hosts who even brought round coffee and biscuits, thus making me fall hopelessly in love with them. Whilst my stuff sold well, in all sincerity the most important product of the day was found in sharing experiences, ideas, hopes and fears with fellow exhibitors, as sometimes trying to make sense of what is and isn't working within your own creative business can be really tricky, making pools of like-minded supportive makers a valuable asset. Nice people I met included my stall neighbour Danann Swanton, who has self-penned a book (no biggie) called Out On The Piste, Richard Lovatt of Automaton whose radish-fronted sketchbook made me coo and illustrator Natalie Ann who had knitted owls and other treasures developed using characters from her own children's books. My favourite element of the day was a raffle to raise money for The Prince's Trust with stallholders donating items as prizes, to which I submitted the original drawing of my Django Unchained illustration, created as part of BADASS. Befittingly the winner ran up to me slightly breathless and wearing shades, so I know he has gone to a good home. 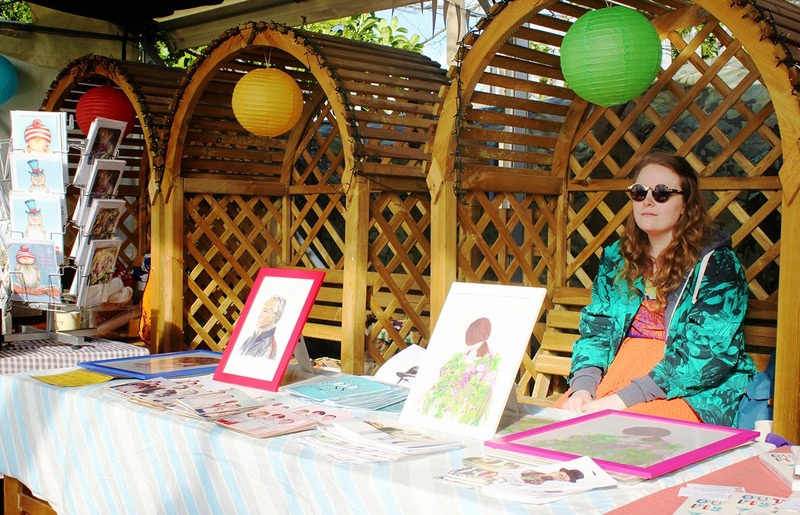 As the day drew to a close and the sun finally made its way round to my stall, I drew forth my own pair of sunglasses and momentarily basked in it like a salamander, here captured by Laurie Ramsell. I'm delighted to say that Three Thinking have invited me back to exhibit at their next event at Urban Coffee Company in Birmingham's Jewellery Quarter. This second creative adventure takes place on Thursday 14th May, 5-8pm making it the perfect post-work tonic. Full details are available via their event page. Come up and see me, make me smile. Cowboys & Robots & Sharks, Oh My!